The online version of this article ( https://doi.org/10.1186/s13075-019-1866-2) contains supplementary material, which is available to authorized users. Tofacitinib is an oral Janus kinase inhibitor for the treatment of RA. 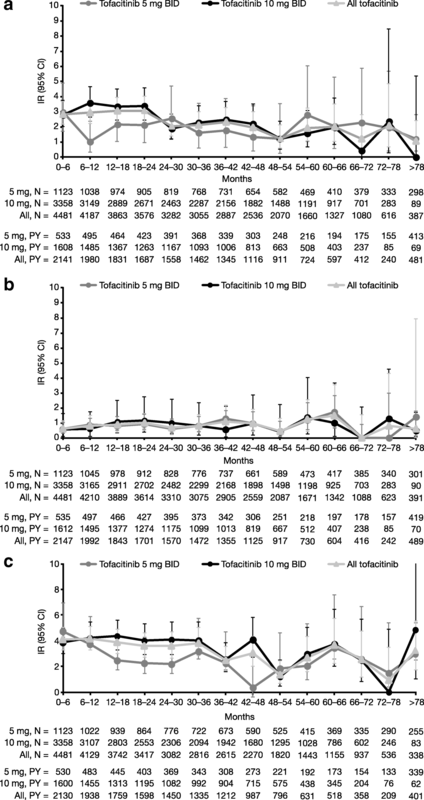 The efficacy and safety of tofacitinib 5 mg and 10 mg twice daily (BID) administered as monotherapy or in combination with conventional synthetic disease-modifying antirheumatic drugs (csDMARDs), mainly methotrexate (MTX), in patients with moderately to severely active RA, have been demonstrated in phase 2 [2, 3, 4, 5, 6] and phase 3 [7, 8, 9, 10, 11, 12, 13] randomized controlled trials (RCTs) of up to 24 months’ duration. The efficacy and safety of therapy is typically evaluated via double-blind RCTs. 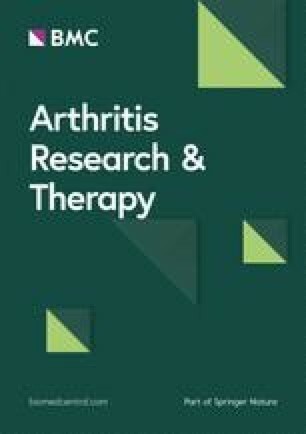 As RA is a chronic disease requiring long-term treatment, it is important to assess the long-term effectiveness and safety of RA therapies to understand the potential lifelong impact on patients’ health and quality of life. Of note, long-term extension (LTE) studies, with their controlled setting and rigorous safety reporting, offer the ability to observe and evaluate long-latency safety events, such as malignancies and cardiovascular events, as well as short-latency events, such as infections. Efficacy and safety data from LTE studies of tofacitinib treatment in global (Study A3921024; ORAL Sequel) and Japanese (Study A3921041) populations are part of the largest clinical development program undertaken for any RA treatment to date [14, 15, 16]. In all, the safety profile remained consistent with that observed in prior phase 2 [2, 3, 4, 5, 6] or phase 3 [7, 9, 10, 11, 12, 13] tofacitinib studies, or prior combined analyses including LTE data [16, 18]. The IRs for AEs leading to discontinuation were comparable for all tofacitinib, tofacitinib 5 mg BID, and tofacitinib 10 mg BID (6.8, 6.7, and 6.8, respectively), as were the IRs for SAEs (9.0, 8.2, and 9.4, respectively). 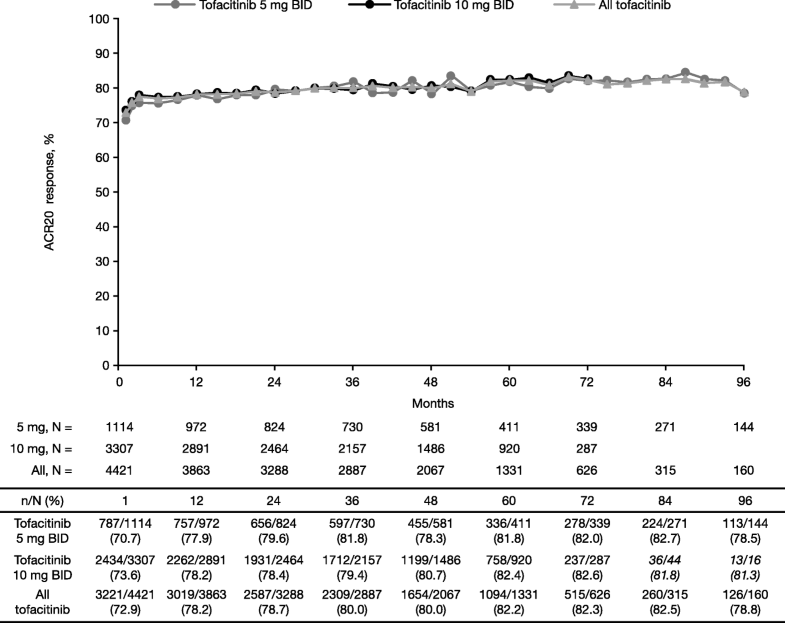 Overall in ORAL Sequel, 52% of patients discontinued by month 114 (24% due to AEs and 4% due to insufficient clinical response) and the incidence of AEs leading to discontinuation remained stable over time. 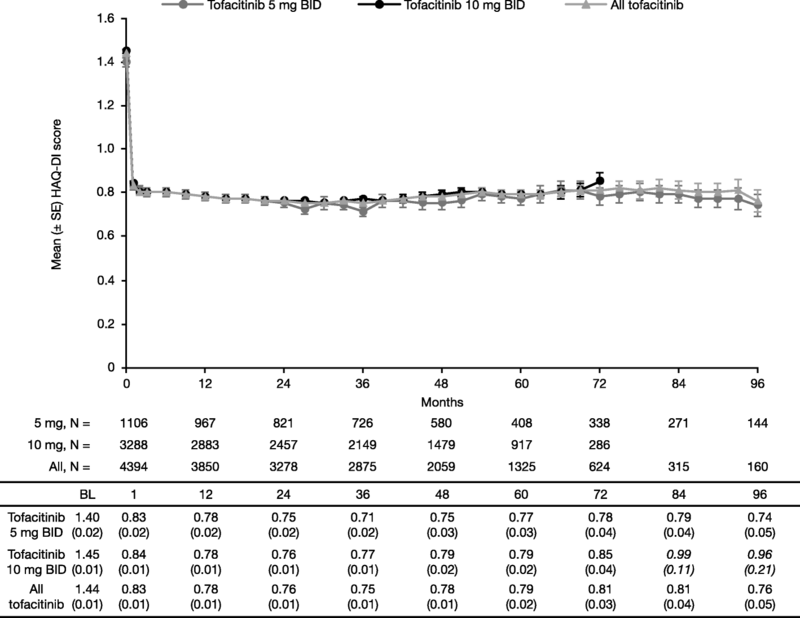 These data are consistent with a recent integrated analysis of safety data over 8.5 years for tofacitinib (5 mg and 10 mg BID combined, with or without background csDMARDs) across 17 phase 1/2/3 studies and two LTE studies, including ORAL Sequel, in which the IR for discontinuation due to AEs was 7.5 and the IR for SAEs was 9.0, for all tofacitinib . Furthermore, in pooled LTE safety analyses from ORAL Sequel and Japanese Study A3921041 (tofacitinib 5 mg and 10 mg BID combined, with or without background DMARDs), 51% of patients discontinued by month 114 (24% due to AEs and 4% due to insufficient clinical response) and the IR for SAEs was 9.1 for all tofacitinib . Infections and infestations were anticipated to represent the most common class of overall AEs. IRs for serious infections were consistent between ORAL Sequel, the integrated analysis of safety data for tofacitinib , and pooled ORAL Sequel and Study A3921041 data , at 2.4, 2.7, and 2.5, respectively, as were IRs for herpes zoster between ORAL Sequel and the integrated analysis of safety data, at 3.4 and 3.9, respectively (data not reported for the pooled ORAL Sequel and Study A3921041 analysis; IR was 7.4 for herpes zoster in the Japanese population of Study A3921041 alone ). 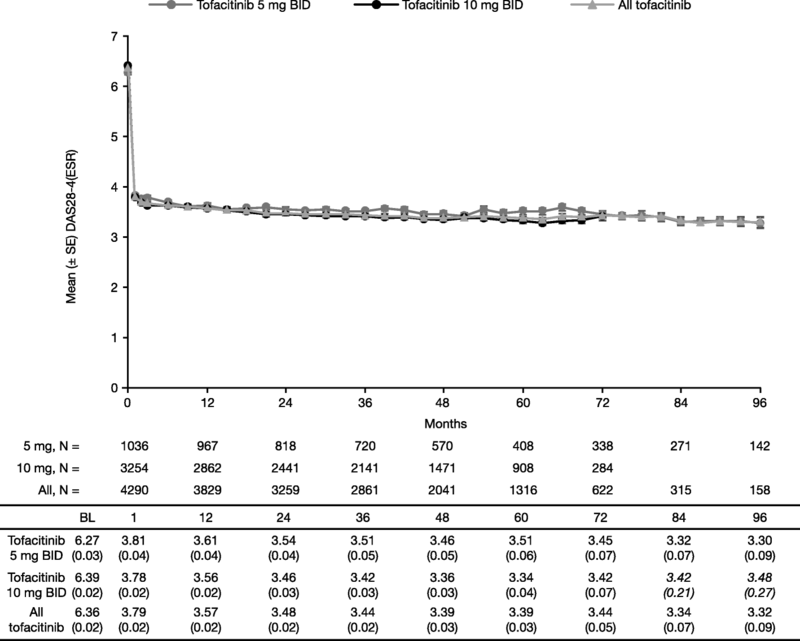 With respect to tuberculosis, the IR for all tofacitinib (0.2) was slightly lower compared with the IR for other opportunistic infections excluding tuberculosis (0.4) in ORAL Sequel. In the integrated analysis of safety data for tofacitinib, IRs were similar between tuberculosis (0.2) and other opportunistic infections excluding tuberculosis (0.3), and concordant with ORAL Sequel data . Prior evaluation has supported the understanding that the risk of tuberculosis in patients receiving tofacitinib treatment directly varies with background tuberculosis prevalence in different geographic sub-populations . ORAL Sequel IR data for tuberculosis are comparable with data for biologic DMARDs [20, 21, 22].